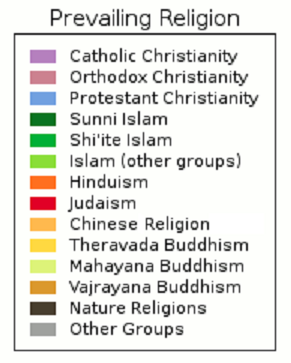 In the above graph, persons who are not members of a major religion are not counted. Thus France is shown as Roman Catholic, even though public opinion polls have found that as many as 54% of its adults are Atheists, Agnostics or hold other non-religious beliefs. Similarly, Sweden is shown as Protestant even though a strong majority of Swedes are non-religious. Also, the Netherlands has more non-religious persons than Catholics, but the country is shown steel-blue to indicate a mixture of Protestant and Catholic. This drawing is copied from the Wikipedia web site at: http://en.wikipedia.org/ and is shown here under terms of the GNU Free Documentation License.